On the backwater colony world of Chalcedony, Delta Pavonis, all is not what it seems… All David Conway wants after the death of his daughter and the break-up of his marriage is a quiet life away from Earth — and when he comes to Chalcedony he thinks he’s found that. 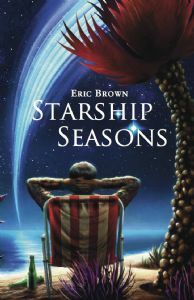 What he does find is a group of people whose friendship will change his life forever, as well as a haunted starship, extraterrestrials with an uncanny ability to read future events, and a conflict between alien races that has lasted for millennia. . . and is about to begin all over again.